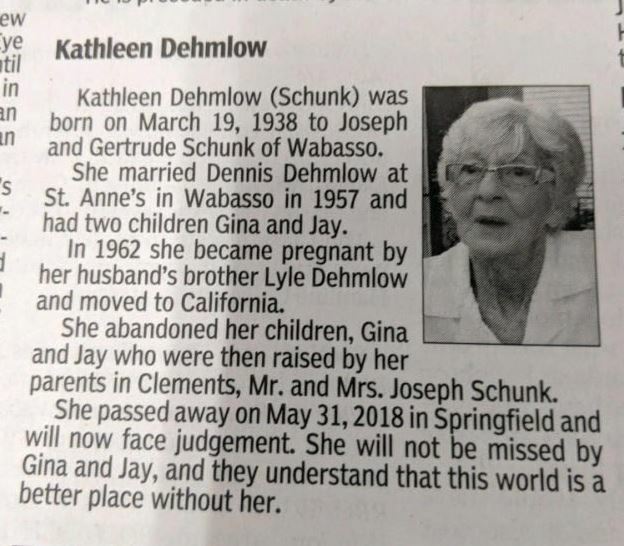 I'm all about the non-traditional obit. There are certainly not enough of them, and I'd know, as I read them daily. Go ahead. Click on it. Make it bigger. Read it. Even in terms of the non-traditional obit, this takes kind of a dark turn. Well, not kind of. It does. This made multiple media outlets, which is how I stumbled upon it. Most of the non-standard have funny stuff written and little anecdotes. I'll go out on a limb that few of them discuss affairs and child abandonment. Granted the brother-in-law thing has to be weird. I know someone / someones, I guess. She was married to a man, had an affair with his brother, divorced dude #1 and then married the brother. That has GOT to make Thanksgiving weird, no? oh oh oh - the brothers worked.....and still work....together. In the above obit, this one doesn't even say when services are and where she's being interred. I'd say it's just a spiteful ad - and it was clearly meant to be - but I'd say after 43 seconds after reading it, perhaps they didn't take it from her point of view. Yes, there are people out there - not just women - who are not meant to be parents. It would be great if they could figure that out before they actually procreate, but sometimes you can't. As it turns out, this was not Ms. Dehmlow's problem, as she went on to have other kids with her brother-in-law (or maybe another guy?) and would show other family members pics of the happy family while she ignored her first one. "Yes, there are people out there - not just women - who are not meant to be parents. It would be great if they could figure that out before they actually procreate" - THIS! I knew from my teen years that having a baby was NOT my thing; I couldn't stand anyone who was not an adult. to this day I wanna punch out a screaming bratley when I encounter one. lucky for me I married a man who feels the same way about crotchfruit. this woman is just...I don't know...but you can bet there are more just like her out there.